Playing Time: 30 - 60 min. The title of this family game says it all: Are You Smarter Than A Fifth Grader? Test your knowledge by answering questions. Not sure of the answer? Find help along the way from one of your classmates. Just remember - if you can't answer the questions correctly - you may not be Smarter than a Fifth Grader. Make your way up the educational ladder and win a million dollars on your way. This is a fun trivial game that doesn't take too much time to complete. 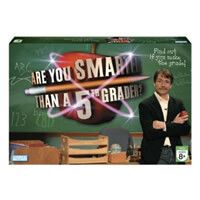 Try playing Are You Smarter Than A 5th Grader with your friends today! Answer 11 grade school questions correctly. Prove that you are smarter than a 5th grader and win one million dollars! This game includes 300 question cards, card reader sleeve, 2 game boards, 4 money marker pawns, 10 grade markers, 1 "peek" pawn, 1 "copy" pawn, 1 "save" pawn, 12 $1,000 tokens, pad and pencils, card tray and the official Are You Smarter Than A 5th Grader rules and instructions. Please keep in mind that the official Smarter Than A 5th Grader party rules and instructions could be different depending on the game version you have. The rules below are some of the exact directions on how to play Smarter Than A 5th Grader. Share with us your comments, funny stories, tips, advice, strategies, creative ways to play, questions about how to play, problems with the rules or anything you want about Smarter Than A 5th Grader. All submissions will be reviewed within 24 hours. Click here to add your Are You Smarter Than A 5th Grader comments. I am trying to turn this game into a math project but it's really hard!! !